Tour operates April to November. If you want to visit Inverness at your own pace and with no hurry, the double-decker tourist bus is your option! You can get on and off all day long, with the same ticket, and learn about the history of the city through a comfortable audio system with earphones. The open top double-decker bus tour gives an insight into the development of the city from the original street between Castle and Kirk, with the oldest building Abertarff House, to the recently completed Highland Archive Centre. Inverness has had 5 castles through the centuries with many famous visitors, not all welcome, McBeth, Robert the Bruce, Mary, Queen of Scots and Bonnie Prince Charlie among them. Plan your day from the top of a double-decker bus, with 360 degree panoramic views of the city. Visit the many churches, including St Andrews Cathedral, which is probably one of Iocal architect Dr Alexander Ross' finest buildings. On the western outskirts of the city, the tour highlights Tomnahurich Hill and the Dochgarroch Lock, where you can hop off for a Jacobite Cruise on Loch Ness. Then take the higher ground for great panoramic views of Kessock Bridge, The Black Isle and the Inverness Firth out to Fort George. The tour introduces the flight of 5 locks at Muirtown constructed in 1822 by Thomas Telford to bring the Caledonian Canal to sea level. The final section of the tour takes you by the South side of Inverness Castle to the Ness Bank Church and the War Memorial. Please Note: This tour takes place in Inverness. Guests on ships docking in Invergorden will need to make their own way to Inverness from Invergorden (approximately 25 miles away) at their own expense. Your cruise ship may offer a bus transfer. There may be taxis at the pier and there is train service. Bus service is also available. Taxi fare to Inverness is approximately 45 GBP for the taxi each way. You should negotiate before getting in the taxi. These rates are approximate, and are not monitored. 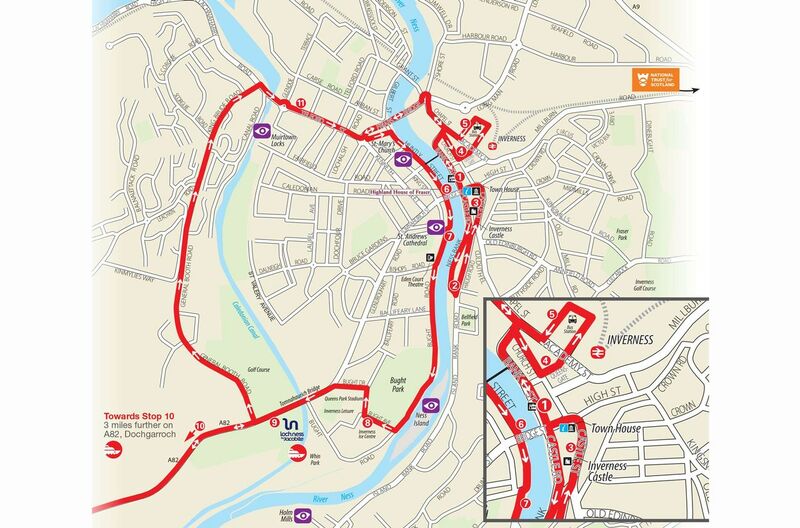 There are 12 stops on this route and it takes approximately 1 hour to complete the route without getting off. The bus runs hourly, and the tours are narrated in English. First and last tour times will be detailed in your electronic ticket. Guests must be able to step up onto and off of the bus. To access the upper deck, a narrow staircase must be climbed. There are steps required to enter several of the sites as well as steep curbs in some areas. We did a walking tour of the city and enjoyed the bus tour. We had an excellent guide who described the sites very well. Our only complaint was the long wait between tours. It was an hour.